It&apos;s being called a "celebration of cool." Fonzie helps to unveil a statue of his likeness in the Wisconsin city where the TV series " Happy Days ," in which he starred, originated. "It&apos;s pop cultural history being made in Milwaukee. And we&apos;re bringing in, of course, Henry Winkler, the guest-of-honor, because we&apos;re dedicating the Bronze Fonz statue downtown … but I think in testimony to how well-liked and how grounded Henry is to this day, all of his colleagues are coming." Dave Fantle from Visit Milwaukee.org says characters from the late &apos;70s, early &apos;80s television sitcom joining the celebration include Mr. and Mrs. C, Joanie, Potsie, Ralph Malph, Laverne, Shirley, and "Happy Days" creator Garry Marshall. Richie Cunningham — superstar movie producer Ron Howard — will be there via video tape. Fantle says the show with a positive message set in the &apos;50s has a sort of "timeless innocence" about it. "It was successful in the &apos;70s because we were coming off some really tough times in our history with Watergate, the Vietnam War. People wanted to leapfrog back to what, at least in their memory banks, was a simpler time." Fantle says Henry Winkler, much like his character Arthur Fonzarelli, is simply a great guy. The Fonz has been called many names, including a "Rebel with a Heart," or "the Tough Guy with a Heart of Gold." 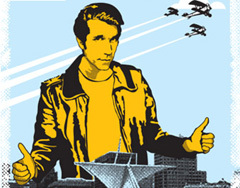 The celebration to unveil the Bronz Fonz takes place Tuesday. Fantle says the project has the full support from Henry Winkler, as well as "Happy Day&apos;s" creator Garry Marshall. The invitation-only dedication ceremony Tuesday morning in Milwaukee&apos;s downtown is followed by a public celebration at Pere Marquette Park. NOTE1: In one episode, Fonzie acquires a library card and boasts, " Reading is cool." The next week showed a 500% increase nationwide of kids obtaining library cards. NOTE2: Happy Days originally aired from 1974 to 1984 on ABC.